She is the class brain, and so of course no one can see that she is truly beautiful - no one except for the sort of weird kid who wants to devote his life to kick-boxing and who likes her because of her brains. He calls her up and asks her out. She says no. He keeps talking. She says yes. And after their first date, she tells her father she likes him because he is utterly straightforward and dependable. He is a goofy teenager with absolutely no career prospects, but she senses that she can trust him as an anchor. She discusses him so openly with her father because they have made a pact: They can say anything to one another. When her parents got divorced, she chose to live with her father because of this trust, because of the openness that he encourages. Her father's love for her is equalled by his respect. And she sees him as a good man, who works long hours running a nursing home because he wants to help people. 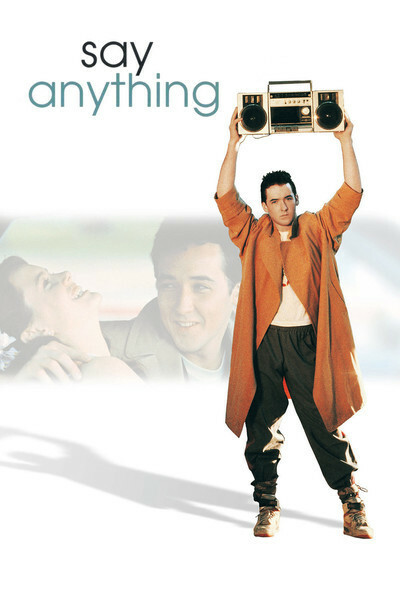 Honesty is at the core of "Say Anything," but dishonesty is there, too, and the movie is the story of how the young woman is able to weather a terrible storm and be stronger and better afterward. This is one of the best films of the year - a film that is really about something, that cares deeply about the issues it contains - and yet it also works wonderfully as a funny, warmhearted romantic comedy. The young woman, Diane, is played by Ione Skye as a straight-A student with a scholarship to England. She is one of the class beauties, but doesn't date much because she intimidates boys. The boy who finally asks her out is Lloyd (John Cusack), and he dates her not only out of hormonal urging, but because he admires her. Her father (John Mahoney) is a caring, trusting parent who will do anything he can to encourage his daughter, but his secret is that he has done too much. They find that out when IRS agents come knocking on the door with charges of criminal tax evasion. The movie treats Diane's two relationships with equal seriousness. This is not one of those movies where the father is a dim-witted, middle-age buffoon with no insights into real life, and it is also not one of those movies where the young man is obviously the hero. Everyone in this film is complicated, and has problems, and is willing to work at life to try to make it better. The romance between Diane and Lloyd is intelligent and filled with that special curiosity that happens when two young people find each other not only attractive but interesting - when they sense they might actually be able to learn something useful from the other person. Lloyd has no career plans, no educational plans, no plans except to become a champion kick-boxer, and then, after he meets Diane, to support her because she is worthy of his dedication. In the way they trust each other and learn to depend on each other, their relationship reminded me of the equally complex teenage love story between River Phoenix and Martha Plimpton in "Running on Empty." What's unique to this movie is how surefooted it is in presenting the ordinary everyday lives and rituals of kids in their late teens. The parties, the conversations and the value systems seem real and carefully observed. These teenagers are not simply empty-headed "National Lampoon's Animal House" retreads; the movie pays them the compliment of seeing them as actual people with opinions and futures. Cameron Crowe, who wrote and directed the film, develops its underlying ideas with a precise subtlety. This is not a melodrama about two kids who fall in love and a parent who gets in trouble with the IRS. It considers the story as if it were actually happening, with all of the uncertainties of real life. When Diane goes in to confront a government agent and tells him that he is harassing her father, who is a good man, Crowe allows the scene to develop so that we can see more than one possibility. He even cares enough give the IRS agent three dimensions. I was also surprised to find that the movie had a third act and a concluding scene that really concluded something. Today's standard movie script contains a setup, some development, and then some kind of violent or comic cataclysm that is intended to pass for a resolution. "Say Anything" follows all of the threads of its story through to the end; we're interested in what happens to the characters, and so is the movie. The performances are perfectly suited to the characters. Skye, who was a model before she was an actress, successfully creates the kind of teenage girl who is overlooked in high school because she doesn't have the surface glitz of the cheerleaders but who emerges at the 10th class reunion as a world-class beauty. Cusack, a unique, quirky actor with great individuality, turns in a fast-talking, intensely felt performance that is completely original. He is so good here that if you haven't seen him in "The Sure Thing" or "Eight Men Out," you might imagine he is simply playing himself. But his performance is a complete and brilliant invention. And Mahoney (Olympia Dukakis' sad-eyed would-be swain in "Moonstruck") finds the right note for a father who cares, and loves, and deceives both himself and his daughter, and tries to rationalize his behavior because he cares and loves. "Say Anything" is one of those rare movies that has something to teach us about life. It doesn't have a "lesson" or a "message," but it observes its moral choices so carefully that it helps us see our own. That such intelligence could be contained in a movie that is simultaneously so funny and so entertaining is some kind of a miracle.